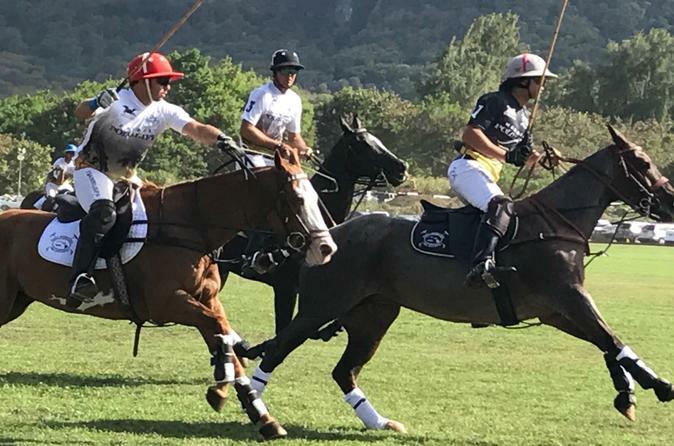 Experience a live polo game at the field in Waimanalo with reserved seating in the VIP lounge that includes a pre-game tour of the stables and players’ area. Your experience will also include a 2-hour tour of spectacular South Oahu with suggested stops at Makapu’u Lookout with views of the healing tide pools, Eternity Beach, Kokohead lookout, and more. Your total experience will last approximately 6 hours and includes hotel pickup and drop-off. You will be picked up from your preferred location in the Waikiki or Honolulu metropolitan area at 12pm by a private, luxury minivan. You will then explore South Oahu island on a private tour. Your local guide will answer any questions you have about Hawaiian history and culture or even the game of Polo. The Polo game will start at 3pm at the Waimanalo field, with the beautiful Koolaus in the background. You will be escorted to your reserved seating in the VIP lounge, where you will have light refreshments, lunch, and drinks available for purchase (at own expense). After the Polo game, you will be returned to your original departure point at approximately 6pm.